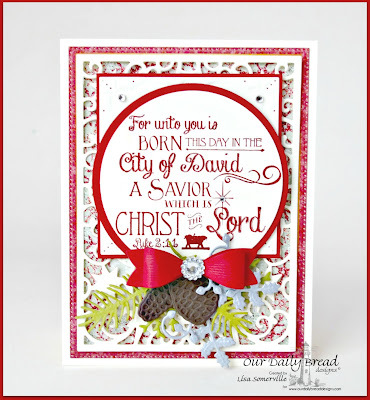 Designs by Lisa Somerville: Our Daily Bread Designs November Release and Blog Hop! Our Daily Bread Designs November Release and Blog Hop! Welcome to the New Release post and Blog Hop showcasing projects from Our Daily Bread Designs November Release! You can see all of the November Releases here. Continue reading below to find out how you can win one of three $25 Gift Certificates to the ODBD Store good towards the purchase of ODBD stamps. Today, I'm sharing two cards using the Born This Day stamp set, Lovely Leaves, Small Bows and Pinecones Die sets from the November Release, along with a few previously released ODBD Custom Dies and the ODBD Christmas Card Collection 2015 (see supply list below). My next card also uses the Omitting Technique so that the verse could be used with the Circle Die cut. Three randomly selected winners will each receive a $25 gift certificate to Our Daily Bread Designs, good towards the purchase of ODBD stamps found in the "ODBD stamps column" of the ODBD Website, just for commenting on the Design Team cards! You have until November 2, 2015 at 9:00 p.m. EST to leave your comments. The Winners will be posted November 3rd, on Our Daily Bread Designs Blog, so be sure to check back there to see if you won! Love the stamp! Cards are so pretty. Hi Teamie. Fun combo of cuts, lovely showcased stamp. Love the different look you achieved by changing the shape of the stamp! Great idea! Such pretty cards, Lisa. Love all the layers on your cards. I love to see different cards using the same stamp. Very nice use of all your elements. Two lovely cards! Beautiful cards Lisa! Love that you used an oval and circle die on the main image!!! Hi Lisa, love your georgeous cards and all of the new releases. What beautifully layered cards, Lisa!! I love your layouts and the added dimension with the foliage! Gorgeous work!! Fabulous release. Love your designs. These are just amazing! I love the scripture sentiments. 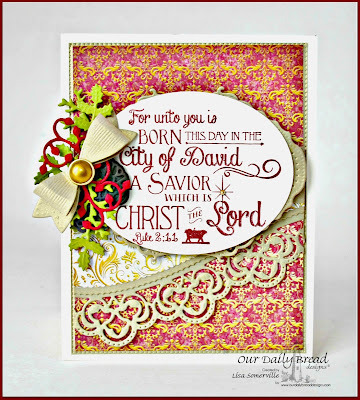 Beautiful cards using the new dies and sentiments with other ODBD dies. The layouts are great. I like that they show off the lovely leaves die. Lovely cards!! The dies you have used are gorgeous!! Love the sentiments!! Both cards are very beautiful. These large Scripture stamps are just divine. Love the simplistic yet elegant designs on these beauties!! Most excellent artwork! Great cards - they have a wonderful feel to then and they are full of so many special touches. Beautiful stuff here! Love Isaiah 9:6 ... the designs nicely frame the scripture! I Love the detailed backgrounds. Beautiful cards! Hi Lisa...LOVE your cards...so pretty, I love all the new sets this month, got to get some on my wish list...so hard to choose..they all great for Christmas! Love the delicate greenery and beautiful verses! Gorgeous cards! Love the Born This Day stamp and you have done it such wonderful credit in your gorgeous cards! Love the different ways you used the Born This Day stamp, Julie…in fact the way you masked off the borders was the inspiration for one of my cards! Beautiful card designs and use of the dies! Both cards are gorgeous! lovely samples, Lis! great idea too, to omit the borders for your designs! the second is my favorite! Lovin these cards! Those little bows just add so much.